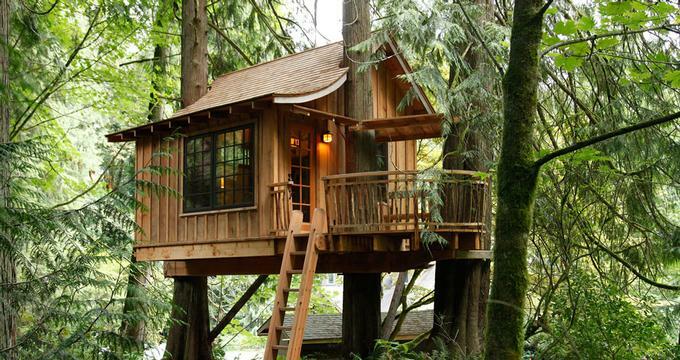 TreeHouse Point is a private overnight lodging destination and event center outside of Fall City, Washington. The property is just a short drive from Seattle which makes it an ideal weekend getaway from the city. Beautifully in sync with the natural environment, Treehouse Point’s six treehouses and central lodge are set in forested land bordering the Raging River. TreeHouse Point is family-owned and built. It was 2005 when Pete Nelson bought four forested parcels of land in Washington’s Snoqualmie Valley, which lies half an hour east of Seattle. His intention was to build a treehouse lodge, because he had been fascinated with treehouses since he was a young boy. He had managed to carve out a market and a living from his obsession, both by building treehouses for others, and by writing six books on the subject. He and his family tell the tale that shortly after purchasing the land, Pete took a walk on it one night when the moon was full and blue. The moonlight seemed to point him towards a magnificent spruce tree, and in the morning he began work on a treehouse in the spruce, which he later named The Temple of the Blue Moon. Visits to Treehouse Point are by appointment only, even if guests are coming only for a tour of the treehouses. It is important to the Nelson family and their guests that the environment stays quiet and private. For this reason, animals are not permitted at the property. Children under the age of thirteen cannot stay overnight unless a group has rented the entire property. Children of all ages are welcome on the treehouse tours. The central lodge on the property has one guestroom. Daily breakfast is served in the lodge, and there is a comfortable lounge with a fireplace where guests can play games or chat. The lodge has Wi-Fi for guests who wish to connect to the outside world. There are six treehouses at TreeHouse Point, most of which are designed for two person occupancy. With the exception of Burl, treehouses do not have modern plumbing, but cedar-walled bathrooms and shower houses are available on the ground, and are stocked with complimentary shampoo, conditioner, and body wash. Towels and bed linens are provided in all treehouses. Umbrellas and flashlights are offered to protect guests against inclement weather and the dark of night. Burl is the newest treehouse on the property, and is the only one outfitted with a sink and a flush toilet. Access to Burl is via a long, steel bridge. Access to the upstairs, where the bed and bathroom are located, is via a ladder that resembles those on bunk beds. Gleamingly clean, and rustically charming, the treehouse has a queen bed, two comfortable leather chairs to recline in, and a small balcony with chairs. Burl looks out on mossy trees, through which the Raging River can be glimpsed. Burl offers an electric kettle, tea and coffee, complimentary bottled water, and a radio. The Temple of the Blue Moon was the first treehouse built at Treehouse Point; it sits in a gigantic spruce tree close enough to the Raging River that one can fall asleep or wake up to the burbling of water over rocks. The Temple of the Blue Moon was designed with the Parthenon in Athens as its guide, and it has many windows and a deck with spectacular forest views. Indoors is a comfortable queen bed and deep leather chairs. Access to the treehouse is by suspension bridge. The Upper Pond Treehouse is larger than the rest: it is a two-storey treehouse that sleeps four people. On the main floor there is a Queen bed and two lofted Singles. This spacious treehouse has a seating area, plenty of floor space, and rocks gently in the breeze to the sound of the wind rustling the leaves. Luggage is lifted to the Upper Pond Treehouse by a pulley. The Nest treehouse is small, cozy, romantic, and inviting with a giant window that makes up one entire wall of the treehouse. It sports a view of a waterfall, pond, leafy trees and birds’ nests. The Trillium treehouse has amazing vistas out of its floor to ceiling windows. Built for two, this two-story treehouse has a seating area on the first floor, and a queen bed upstairs, via a ladder. Bonbibi is the smallest of the treehouses. Nights and mornings can be spent listening to the sound of the river from a comfortable queen bed, or overlooking the water from the treehouse’s small private deck. Access to the treehouse is up a graceful spiral staircase built around the trunk of the tree. The Cedar Room is located in Treehouse Point’s main lodge. It has a handsome California King size bed, deep armchairs, a desk, and a balcony from which to view the rest of the property. Delicious breakfasts are served to guests every morning in the main lodge. Guests may enjoy coffee and tea, fruit juice, homemade granola, fresh fruit from local farms, yogurt, eggs, and hot side dishes such as quiche and bread pudding. Treehouse Point does not have a restaurant, but is glad to recommend eateries in the Fall City and Issaquah area. Massages are available to guests; treatment consists of a deep and luxurious massage combining therapeutic and wellness centered practice. On-site, guests of Treehouse Point may enjoy yoga classes three days a week, which are geared to all levels. Hatha, Yin, and Vinyasa yoga techniques are practised, and use the natural surroundings as inspiration for relaxation and meditation. Yoga is practiced in the Pond Room alongside the Pond. The lodge has something for everyone. It supplies coolers to treehouse guests who have brought their own beverages and snacks. S’mores kits are complimentary for guests who wish to bake goodies at the fire pit, and cookies are available in the late afternoon/evening for guests wanting something sweet to nibble on. The lodge supplies books, magazines, board games, and even reading glasses for guests looking for relaxing activities. Hiking is a popular activity in the mountains that surround Treehouse Point, and there are many good trails within easy driving distance. The adventurous may try their hand at several steeper slopes: Mount Si, Tiger Mountain, or Cougar Mountain, and may find themselves climbing alongside the mountain goats that make their home in these hills. Rattlesnake Ridge is a popular destination for moderately difficult climbs, and novice trail walkers can enjoy Taylor River Trail. Scenic vistas and mountain wildflowers in bloom make these hikes unforgettable. Cyclists and equestrians will find several trails open to bikes and horses, and both can be rented at a number of trailheads. The Fall City and Issaquah area is host to a selection of great wineries and tasting rooms for those who enjoy fine wines and the beauty of vineyards. Summer brings locals and visitors alike to the many farmers’ markets in the region. These markets offer much to do, sample, and buy. Markets offer organic produce, baked goods, fresh-cut flowers, local cheeses, arts and crafts, and a variety of locally-grown spices. Tasty lunches can be found at every market, and visitors can dine while listening to live music, or while watching cooking demonstrations.